Oh my god, we just created a pizza so stupid delicious I decided it was even worthy of Fiesta Friday’s One Year Anniversary Extravaganza. And that is no small thing because the other guests bring such amazing food every single week it could make you weep. I actually have shed a tear or two. Follow that link above and you’ll see what I mean! But about this party pizza – this super sausage-saucy pizza – even I can confidently claim it is a thing of beauty. Will you need an antacid before bed? Probably. But what great celebration doesn’t end with a little heartburn? Isn’t minor-to-middling digestive discomfort one of the sure signs of a hugely successful dinner party? Trust me, this pizza is worth a little pain. Before I get into the details let me say that I have tried numerous times to make pizza dough at home. At best, it has been solid enough to hold toppings. At worst, well, same answer. Mostly I’ve produced varying thicknesses of a somewhat edible cardboard-like substance so I am truly excited to have found an easy recipe for perfect pizza crust. It is also exceedingly simple, even for someone like me whose only attempts to use yeast resulted in the afore-mentioned cardboard product. 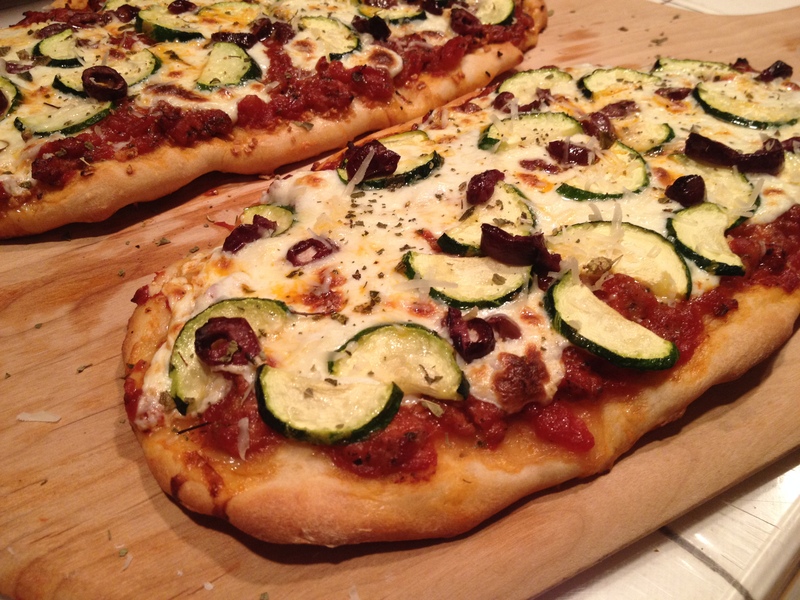 I found this miracle homemade pizza recipe on my favorite all-around cooking blog, The Kitchn. 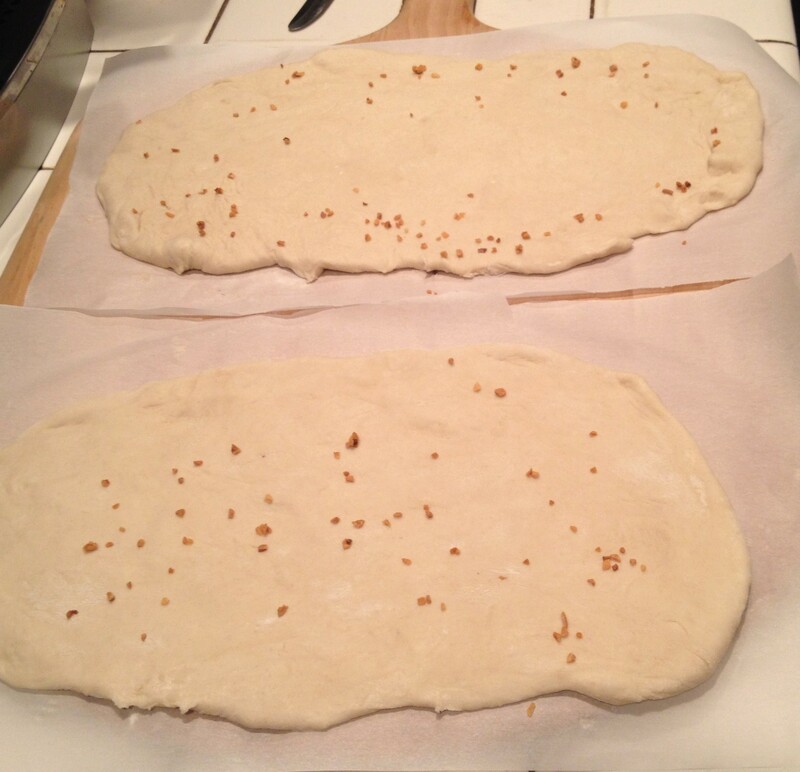 I followed it exactly with only the minor exception of making the dough into longer, narrower flatbreads so we could cook two at a time. For a party I’d recommend splitting it into four small flatbreads, which would make the pieces a bit more bite-sized and manageable as a finger food. 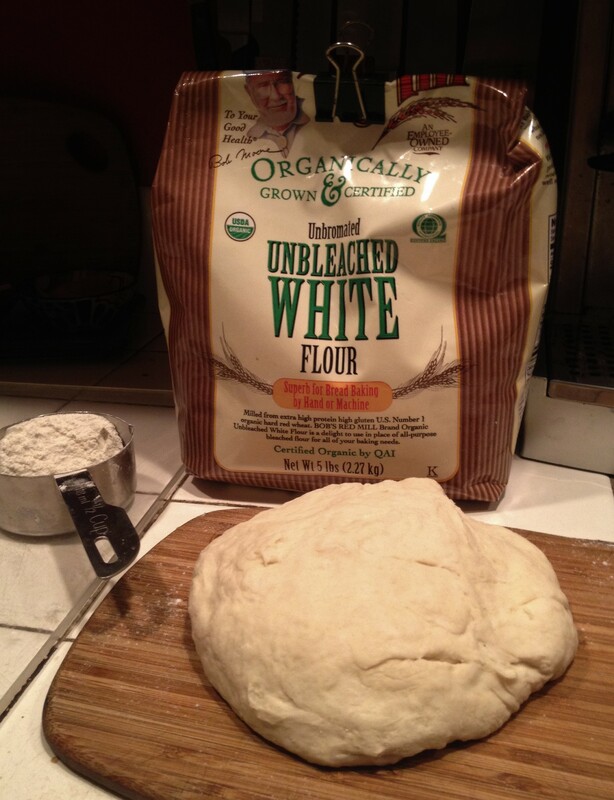 Below is a photo of my finished dough. We first tried this recipe last week and kept things simple: tomato sauce, pepperoni, shaved brussels sprouts and fresh mozzarella. Oh man, this pizza was so chewy and crispy and cheesy and delicious! We managed to save some for lunch the next day and it even reheated well, a true test of a good recipe in our kitchen. That and the fact that there are no photos because we are huge pigs and after seeing the pepperoni all crispy and shimmery we couldn’t spare 40 seconds to take a single one. Oh well, it was pretty. So as we’re preparing our dough we know going in that we’ve got a fantastic crust to work with. We also know we can’t show up to this particular party with some plain Jane pizza, we need to innovate! 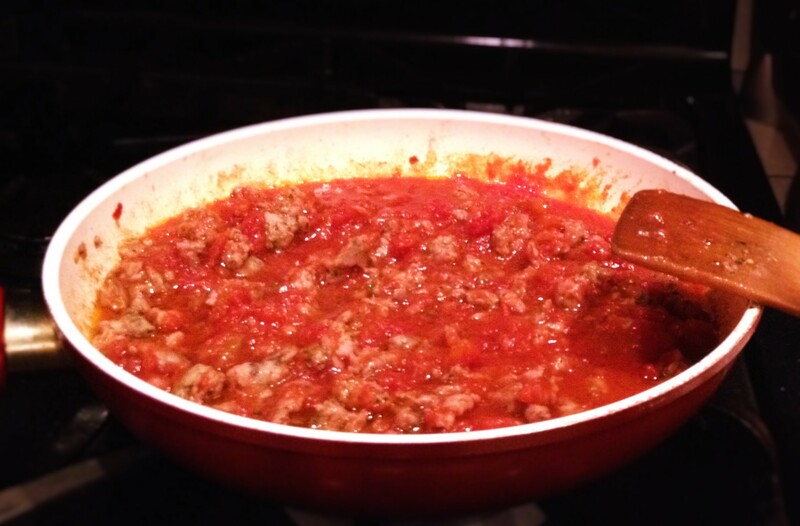 Enter “sausage-sauce.” What is sausage-sauce, you ask? Absolute decadence. 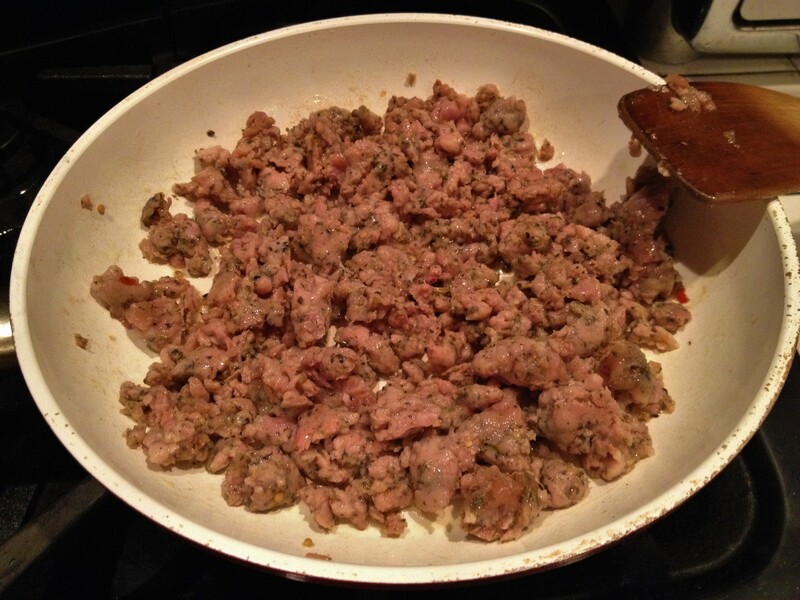 We started with two Chicken Pinenut Basil sausages from our local gourmet market. We like to cheat by buying the uncooked sausages then splitting open the casings and treating it like the best pre-flavored ground meat you could hope for. We got the meat into the pan with a little olive oil and as it cooked I continuously chopped it into little pieces with a spatula. Once it was cooked through and lightly browned I added about 14 oz. of Pomi chopped fresh tomatoes. I stirred it all together and, as the goal was to produce a thick sauce, simmered it over medium for 10 minutes. I also added some wonderful organic garlic powder, a large pinch of dried Italian basil and copious amounts of dried oregano. After allowing the flavors to meld a bit I salted to taste, 1/4 tsp. or so. As the sauce simmered and the dough rose we prepared our toppings. 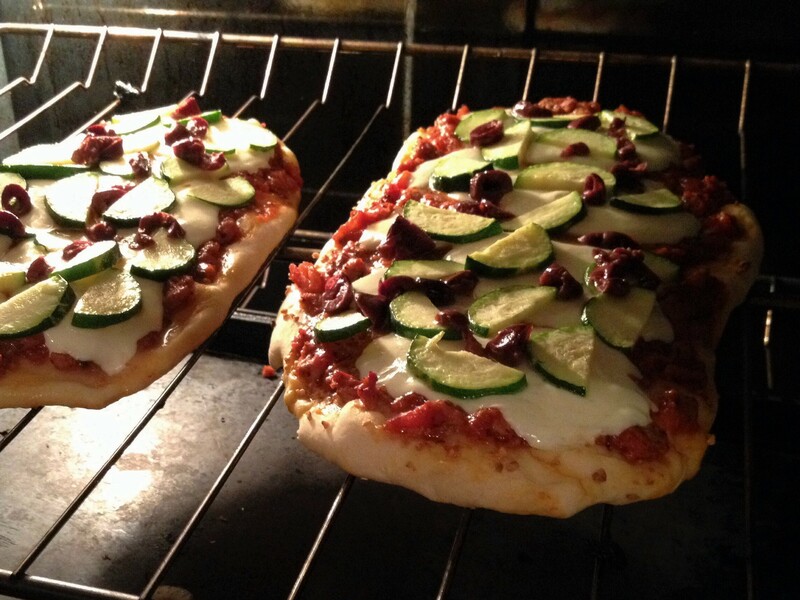 I love making pizza because you can really have fun with toppings and use what’s on hand. This is especially fun when the garden is bursting with fresh veggies, but the garden is offering slim pickings a the moment so we settled on sliced kalamata olives, zucchini and fresh mozzarella. I use the term “settled” lightly – these are some of my favorite pizza toppings! A little bite, a little zing, and a little sweet crunch on a bed of gooey cheese, it’s a great combination. Finally we were ready to build our pizzas. Following The Kitchn’s instructions, I readied two pieces of parchment paper, divided the dough and gently pushed and pulled it into shape. As promised, it stuck just slightly to the parchment paper which kept it from springing back and driving me nuts. Jon had the brilliant idea of scattering roasted garlic bits onto the crust (I was hesitant but am now a believer). Then we spread ALL OF THE SAUCE onto the crusts. They were absolutely covered and I was afraid they’d end up a soggy mess but the magic crust held up beautifully. 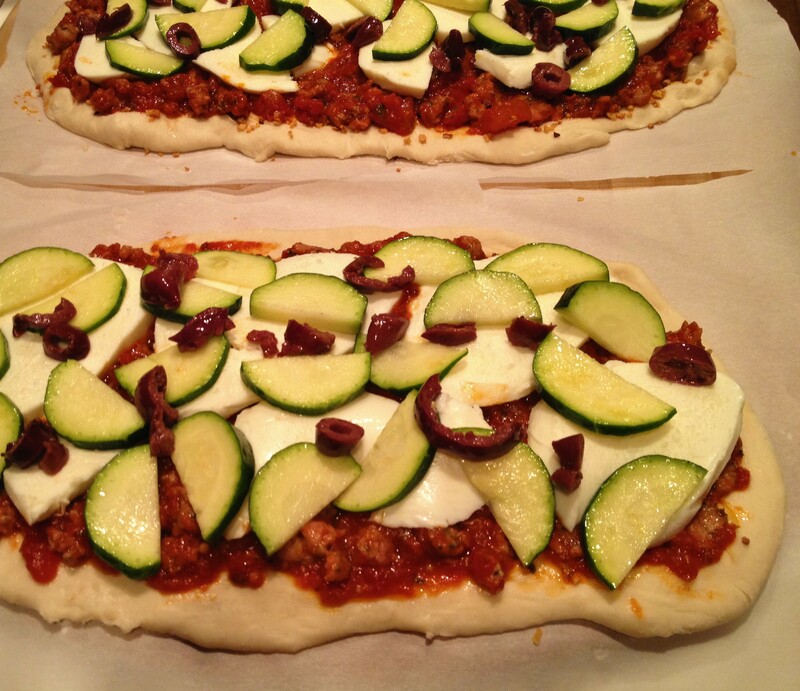 After heaping on generous amounts of fresh sliced mozzarella, zucchini and sliced kalamata olives our pizzas were ready for the oven. I loved that we could just slide the parchment paper right onto the oven shelf. After five minutes we were able to slide the paper out and finish cooking right on the shelf. This process left us with a nice firm crust, no soggy bottoms for us! It also left us with a stinky burnt mess on the bottom of the oven when our cheese melted and oozed over the edge so we ended up putting a baking sheet on the shelf below. Obviously the good folks at TheKitchn aren’t accustomed to writing recipes for gluttons. Once the allotted time was up the pizzas were cooked but we decided to leave them under the broiler a couple minutes, just long enough to brown the top a bit more. A smattering of oregano over the top, a sharp knife for slicing and our decadent sausage-sauce pizzas are ready to party! Shoot, I’m realizing now that we forgot to save any for the party. Whoops. But hey, we brought a bunch of cheap wine and a ukulele so we hope you’ll let us stay! Happy Anniversary everyone! I hope you all like You Are My Sunshine, it’s the only song I can play at the moment. Actually the antacids might come more in handy after listening to me destroy perfectly lovely tunes on my uke… Ah well, gotta start somewhere. Thanks for a great party Nancy! I so enjoy your postings, they really put a smile on my face. Have you considered gathering them all together and publishing a ‘cookbook’ or should it be called a ‘cookblog’, not only of the recipes but all that you tell us about what you go through growing and making your food? I for one would be more than happy to buy it!!! I am sure others would too. I love the happy feeling I get reading them. This pizza is definitely worthy of the party, it looks amazing!! YUM! Homemade pizza is one of my specialties! 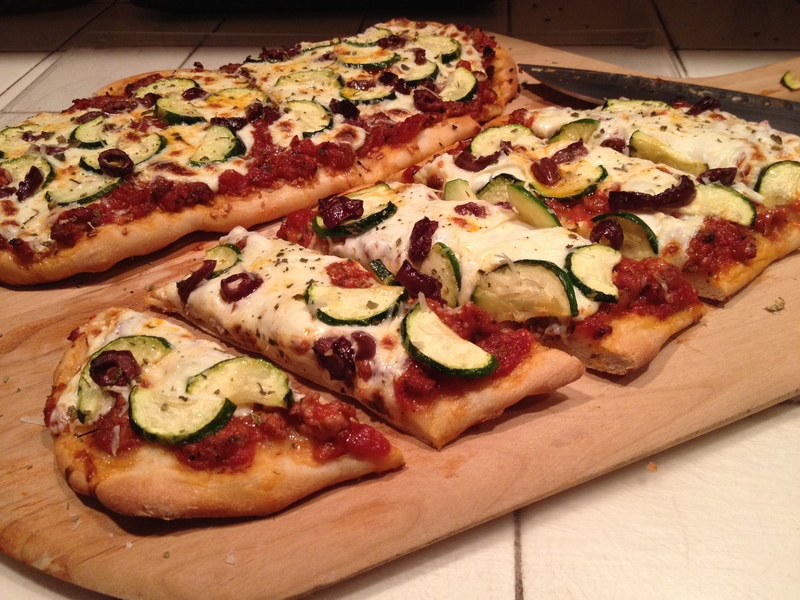 I use a California crust recipe (happy to share with you) – nothing beats a homemade crust pizza! I usually add a little cayenne to the crust to give it some zing. My pizza making took a bit of a dip when I became Vegan – but pizza crust is Vegan – I just needed to adjust some of the toppings. I have figured out how to make homemade Vegan mozzarella cheese (thanks to “It doesn’t taste like chicken”), and my absolute favorite combo is now oil cured black olives, caramelized onion and just a hit of gooey Vegan cheese. (Oh, I shouldn’t be writing this before breakfast.) You have encouraged me to make some homemade Vegan sausage for homemade pizzas! We usually use a stone and special pizza pan (with holes in it) for crust baking. If you enjoyed sliding that crust off the parchment, you need to get a pizza peel – after all you’re a professional now! 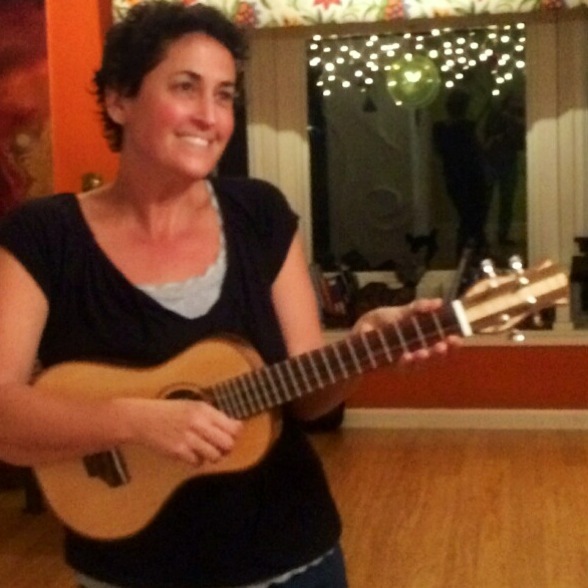 I forgot to mention I love the ukulele! Thank you, isn’t is beautiful? I received it as a reward for backing a friend’s kickstarter. He handcrafted it from 150-yr-old Spanish cedar, rosewood, and walnut. Now I just need to learn to play the thing!